"I like to be scared" comes out of Nux Gallica's mouth as often as "I like to be cold like Queen Elsa," or, quoting Frozen's hit song, "The cold never bothered me anyway" (usually in response to me trying to wrestle a jacket onto her before we go outside). This is the three-year-old with a film buff uncle who claims her favorite movies are Ghostbusters and Spiderman (the Tobey Maguire version) and proves it by demonstrating that she has memorized the dialog. This is the child with the imagination that leads her to fret at bedtime, "There's a monster under the bed," only to be comforted by my assurance, "Don't worry, the ghost in the corner will take care of it." "You mean the nice ghost with the spider on its head?" she whispers. I nod, and she snuggles into the covers and drifts sweetly to sleep. 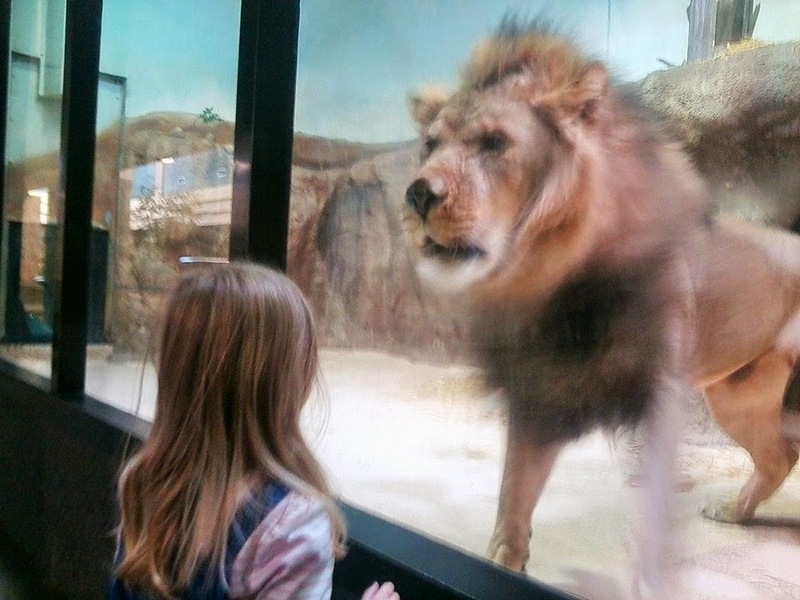 To the lion at the zoo, Nux Gallica said, "Pooh pooh!" Nux is not the next Wednesday Addams. She loves pink and purple, sparkles, hearts, Barbies, princess dresses, and My Little Pony. It's just that she also loves the thrill of pretend-scary things. Maleficent was thoroughly enjoyed by all (me, Nux, and her Nonna), and Nux even called (out loudly, to my chagrin) a couple of plot twists before they happened. Talk about pattern recognition--this kid has only seen a handful of Disney films. (Now that's what I call scary.) If you haven't yet seen the magnificent retake on Disney's Sleeping Beauty, here's a fun review by a mother who had an extra-special experience watching the movie with her child. I liked the way Disney came through with a tightly woven plot made up of reshuffled elements of the tale, using an old literary/traditional version of the sexually/romantically spurned, vengeful fairy to ask the question, "Why did the villain do this evil thing?" To be honest, I was also relieved that the angle Disney used, which was glorious and made for some awesome movie images, veered completely off from from the angle I'm using in my literary novel retelling of the Sleeping Beauty tale (not the Disney movie but the folk tale). Instead of asking "why" about the bad fairy's actions in my book, I go back further: Did the "bad fairy" even place the curse, or was it the girl's own father? Was the fairy bad? Was she a fairy? Was a magical woman even present at the christening, or was she invented or used as a scapegoat? I've been working on my manuscript for several years, so needless to say, I felt deep relief that Disney chose a different path. And that's the beauty of folk tales--there is a nearly infinite array of versions and interpretations for each tale, allowing for many diverse, interesting and delicious retellings. There were, of course, trailers for other movies shown before Maleficent, including one for The Book of Life, which Nux thought looked good. My "cultural misappropriation" antennae went up immediately upon seeing this ancient religious and cultural tradition used as the premise of a mainstream U.S. film, but I did notice that many actual Mexican people are involved in the voices and filmmaking. Hmmm, perhaps I will let Nux's Tia Esperanza screen this movie first, if she's interested, and give her opinion on whether it is too problematic. My hunch is that with some conversation about stereotypes and cultural differences, it will probably be okay. Day of the Dead is an important tradition in my household and at my church, though the way we do it in the Midwest is a bit different from the way Tia's family does it in Mexico. In any case, with a child of Nux's social norm absorption level, I'm much more concerned with stereotypes than scariness here--but wow, this movie sure looks pretty, doesn't it? Speaking of sheer beauty in children's film, we are also giddy to discover that the creators of one of Nux's all-time favorite movies, The Secret of Kells, will soon release a second film, Song of the Sea! The European company's next animated masterpiece (I have high expectations) is a story of selkies. Already, Nux wants me to play this trailer repeatedly so she can hear the beautiful music, which echoes the eerie, haunting melody of what she calls the "ghost kitty song" sung by her idol, the "fairy wolf" in The Secret of Kells. It sure is fun to be the mommy of a girl who loves movies and likes to be scared!